The end of the year is upon us, and that means that alongside all the hustle and bustle of the holidays, another busy season is due to follow—Year-end closing. 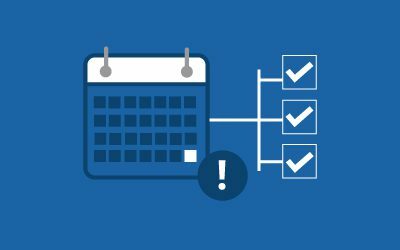 If you are using Microsoft Dynamics GP, there are a lot of resources, steps, and procedures to close the year out strong. Today, we would like to share tips, tricks, and helpful links to help you have a stress-free close. As always, year-end updates make large-yet necessary changes to U.S. Payroll, including Payroll and Payables Changes and Updates for ACA Reporting. Form 1099-DIV: Box 5 Section 199A dividends has been inserted in to a previously blank space on the Payables 1099-DIV form. Existing box numbers were renumbered from Box 5-14 to 6-15. Box 5 was previously Investment expenses. Investment expenses is now Box 6 (all subsequent boxes have been incremented as well). Form 1096: Two new form option checkboxes added. Form 1099-R: additional Distribution Codes C and M for Box 7 allowed to be entered on Edit 1099-R window. These codes and amounts associated with them will then be printed on the Print 1099-R form. ACA Form 1094-C: Checkboxes in box 22 Certifications of Eligibility have shifted on form 1094-C.
ACA Form 1095-C: Formatting updates. System: Potential error with the ASIEXP86 table (SmartList Favorites Columns Master) when you upgrade to Dynamics GP 2018 R2. 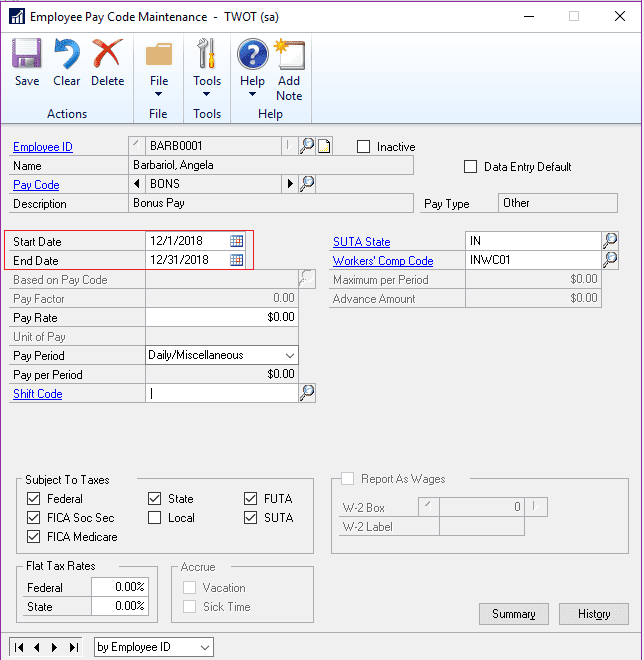 Payroll: Aside from much larger Payroll changes in GP year-end, Microsoft notes that there are a few things to watch for in the event you key a transaction outside the pay code start/end date or if the start date falls between pay period dates. Further, the Mandatory arrears information is not populated in the APR_APR30300 table. Project Time and Expenses: A few changes include that PTE Timesheets may be updated with incorrect billing status using various tab orders in Web Client, an incorrect billing status that may be used when using looking glass to select a cost category to add a new item to a multi-line timesheet. Microsoft also notes that the entry window may slow when making edits to previously saved lines. VAT: A few changes made when calculating VAT regarding purchasing tax amounts, sales returns and credit memos, and purchasing returns and credit memos. Purchasing tax amounts from GL entries are subtracting from boxes 2 and 7, instead of adding to boxes 4 and 7 on the VAT Summary. Sales returns and credit memos are not deducting total taxable amount from box 6 on VAT return, and voids from box 1 and box 6. Purchasing returns & credit memo’s, voids are not deducting total taxable amount from box 7 on VAT return, and invoices not updating box 4. GP 2015 adds changes to Payables forms 1099-DIV, 1096 and Payroll 1099-R (Pension). The year-end close needs to be completed in a specific order to avoid errors or miscalculations during the closing procedure. Complete the posting procedures and the closing procedures for other modules (only required if GL is integrated with other modules): Post final transactions in all modules except for GL and complete month-end for all modules before completing year-end in each module. Per KB 888003, Microsoft recommends you close in the following order Inventory > Receivables Management > Payables Management > Fixed Asset Management > Analytical Accounting. Post the final adjusting entries in General Ledger: Make entries to correct errors. Print an account list to verify the posting type of each account. Determine which accounts are closed to retained earnings (moved to balance sheet) and which go to profit and loss. Close the last period of the fiscal year (optional): prevents transactions from being posted to the wrong period or to the wrong year. Perform file maintenance on the Financial series group of modules (optional): Run the check links procedure on the Financial series group of modules. Verify the settings in the General Ledger Setup window: Determine whether you want to keep historical records and verify that the box is checked or unchecked in the Maintain History area. Make a backup: Backups are critical to reduce the pain if anything goes wrong. 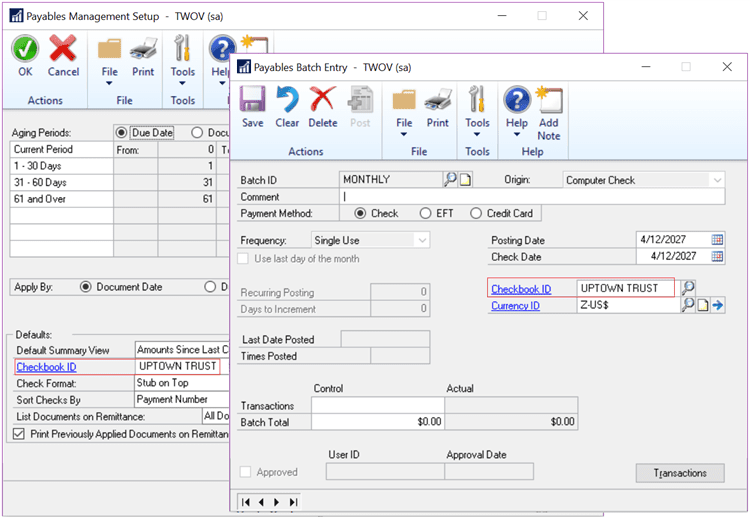 Print a final Detailed Trial Balance report: Use the Trial Balance Report window to print Detailed Trial Balance Report. Print the year-end financial statements: Print any year-end financial statements that are required including but not limited to Balance Sheet, Profit and Loss Statement, Statement of Cash Flows, and Statement of Retained Earnings. Set up a new fiscal year: You must set up a new year before closing this year. Close the fiscal year: point to Toolson the Microsoft Dynamics GP menu, point to Routines, point to Financial, and then click Year-End Closing. See notes on using divisional retained earnings accounts here. Close all the fiscal periods for all the series (optional): Done to prevent transactions from being posted from any module to a closed period. 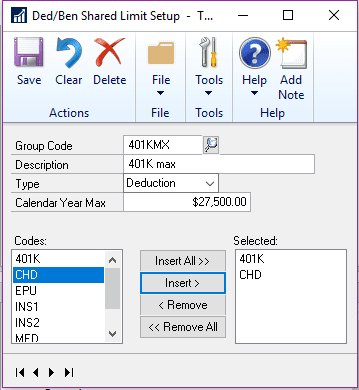 Adjust the budget figures for the new year, and then print the financial statements: Adjust budget figures in Excel-Based Budgeting, Budget Maintenance, or Single-Account Budget Maintenance. Make a backup: This backup gives you a permanent record of the company’s financial position at the start of the new year. Knowledge Base article 888003 explores a wide range of questions and answers about closing the year, providing helpful tips and tricks to make the year easier. Additionally, get more information about 2018 year-end close here. Integrated Business Group has been a leader in implementing and supporting Dynamics GP for our customers. With decades of ERP experience including in Dynamics EP, IBG is a trusted Microsoft Partner who can handle any of your Microsoft ERP or CRM needs. Learn more about our Microsoft Dynamics support services and contact us for more information. FRx had a good run. Released as an MS-DOS application in 1991 and a Windows product in 1993, the product changed the way that companies completed reporting, offering powerful functionality at the time and much-needed intelligence. Acquired by Great Plains Software, who was in turn acquired by Microsoft, this reporting tool spent decades in the spotlight as the go-to application for reporting. However, time passed and the competitive market evolved; by the end of the 2000s, FRx was no longer atop the reporting world and Microsoft announced that it would no longer offer new licenses for the product. Dynamics GP 2010 saw Management Reporter introduced as a replacement for FRx, a powerful alternative to an aging product. The beginning of the end for FRx was announced in 2010 and by December 2012, FRx sold its last license. On December 31, 2012, Microsoft terminated support for FRx, marking the official transition to Management Reporter. The switch from the familiar FRx to the new MR platform was cause for concern at some organizations—long-time users of FRx lost the familiar Excel interface for a proprietary one and lost some small-but-unique features. In GP 2013, 2015, and 2016, MR was the stock application for reporting, but this all changed in 2016. Announced privately at Amplify 2016 and publicly a week later, Microsoft informed the world that there would be “no major enhancements” to Management Reporter. While still supported until 2026 and available to integrate with Dynamics GP 2013, 2015, 2016, and 2018 (along with other Dynamics products), eight years is a long time to go without an improvement. With six years having passed since the last FRx license was sold and two since the last major Management Reporter update, many users are wondering what’s next for their budgeting and planning. If you’re asking this exact question as you enter planning season, join Integrated Business Group and Jet Global Data Technologies for a brief one-hour webinar on Tuesday, October 30, 2018 at 11:00 AM EST. Click here to register or read more below. In this webinar, technology experts will discuss the challenges of working with the no-longer supported Microsoft FRx reporting tool and no-longer updated Management Reporter, introducing two powerful budgeting and reporting solutions— Jet Reports and Jet Budgets. Imagine a familiar Excel-based interface, but smarter. If you miss the “good old days” of FRx (or are still using it) but are looking for a reporting platform that’s not only more powerful but provides continued support and updates, Jet Reports Professional provides both. With Jet Reports Professional, you receive fast, flexible financial and business reporting within Excel, giving team members access to advanced, accurate, and automated reporting data in a familiar interface. The October 30 webinar will discuss Jet Reports functionality as the ideal replacement for FRx—providing a Dynamics-friendly reporting tool used by more than 14,000 companies. Budgeting has always been a blind spot in ERP software. This isn’t a Dynamics-exclusive issue; few ERP platforms have the budgeting functionality needed by today’s business. Between design, collaboration, approvals and execution – there are numerous moving parts to the budgeting process that are often impossible to control. Unfortunately, this results in a chaotic, time consuming, and inaccurate approach to budgeting filled with email chains, inconsistencies, and animosity across the company. Jet Budgets was designed specifically for Microsoft Dynamics and gives companies the power to control and streamline the budgeting process with a simple, adaptable, and easy-to-use fiscal planning solution. With automated workflows and an intuitive design, Jet Budgets allows organizations to cut their budgeting time in half, ensure consistency in the planning process, and fit an organization’s unique processes. From Excel-based reporting to GP-friendly budgeting, companies like yours are considering their next steps as they look to take control of their financial planning and analysis in 2019 and beyond. Join Integrated Business Group and Jet Global Data Technologies on Tuesday, October 30, 2018 at 11:00 AM EST to learn how Jet Reports Professional and Jet Budgets can be the perfect tool for your reporting and budgeting needs. Click here to Register. On October 1, Microsoft released Dynamics GP 2018 R2, an update designed to solidify the already-innovative and powerful Dynamics GP 2018 platform. Not only does the R2 update make necessary fixes to the software, it adds a wide variety of new features as requested by users. From the small to the large, these new features improve the user experience and make life easier for end users and administrators. Today, we would like to turn our attention to seven more features that will appear in GP 2018 R2, including improvements to the Purchasing All-in-One view, SmartList updates, inventory, administrative enhancements, and more. The Purchasing All-in-One View has always provided users an easy way to view purchase orders, receipts, invoices, payments, and credit documents. However, previous editions required the GP document number—something many users didn’t have on hand. Now, GP 2018 R2 allows users to view and sort related documents using the more-commonly used vendor document number. When a customer makes a deposit on a transaction yet to post, it’d be nice to track these deposits throughout the process. 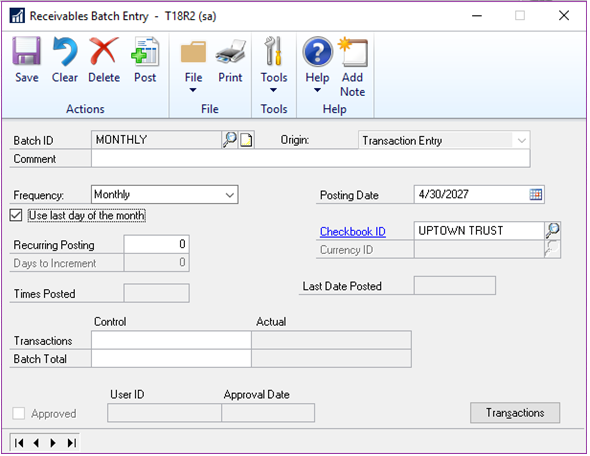 Now GP 2018 R2 features a SmartList setup that allows users to quickly see customers that have put a deposit on a sales transaction but the sales transaction hasn’t been posted. No more searching through the sales records to see the deposits, now you have a new SmartList to view the details. 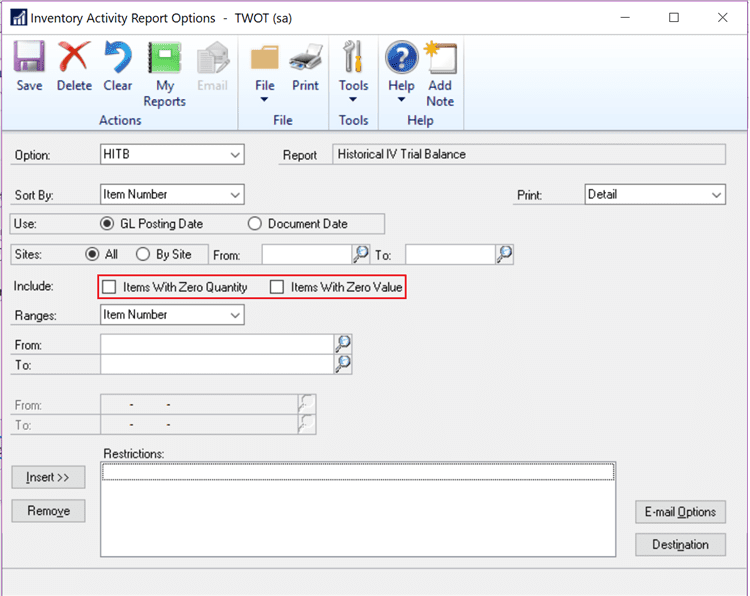 The Historical Inventory Trial Balance (HITB) report has two new print options in #GP2018R2, allowing you to choose whether to include or exclude items with zero quantity or value. These items will be excluded on the report if the options are not checked. By default, these items were included before but now you have a choice when printing the HITB report. 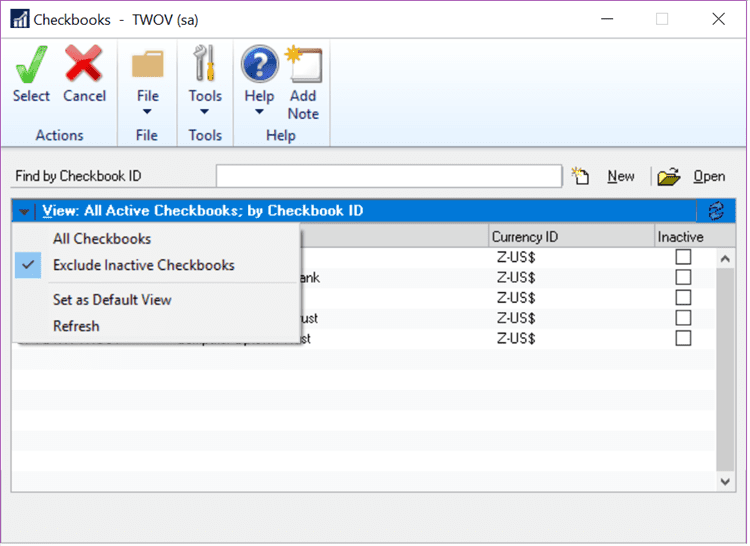 If you do not want to print zero quantity/value items, then leave these checkboxes unmarked. A strong password is a small but necessary step to increasing your firm’s cybersecurity. Especially in a financial application like Dynamics GP, you need to create a secure password to minimize the likelihood that a hacker could access your data using a brute-force attack, guessing your password using many guesses. Now, GP 2018 R2 features a longer maximum password (21 characters, maximum allowed by SQL). Microsoft has long featured password expirations as a security feature, but too often password expirations would just ‘happen’ at 10:00 on the expiration date. 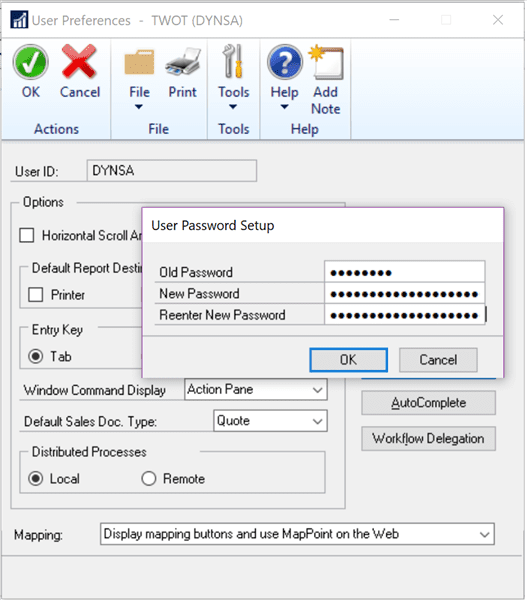 Now, GP 2018 R2 adds a warning screen when a user logs in for the seven days preceding the password’s expiration date. This gives users a chance to think up a new password. 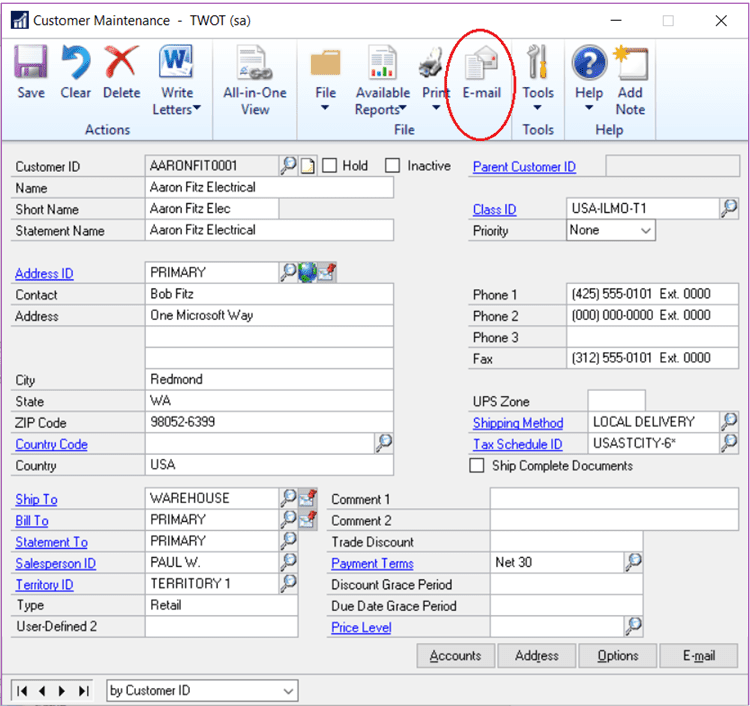 A major convenience improvement, GP 2018 R2 now allows for a more convenient way to email statements to customers directly through the Customer Maintenance window. The new feature adds the ability to email customer statements by clicking a new button in the ribbon of the Customer Maintenance Window. GP will use the email address on file to send the email. 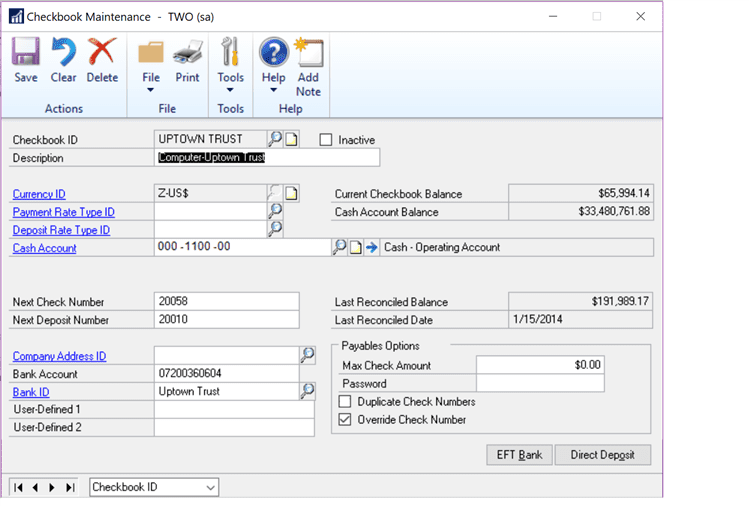 Formerly available in the Payables checkbooks only, a new feature has been added to GP 2018 R2 that will provide the option to allow or not allow Duplicate Check Numbers has been extended to Bank Transaction Entry, Payroll Manual Checks and Miscellaneous Checks. If this option is not checked duplicate checks are not allowed in these three windows. 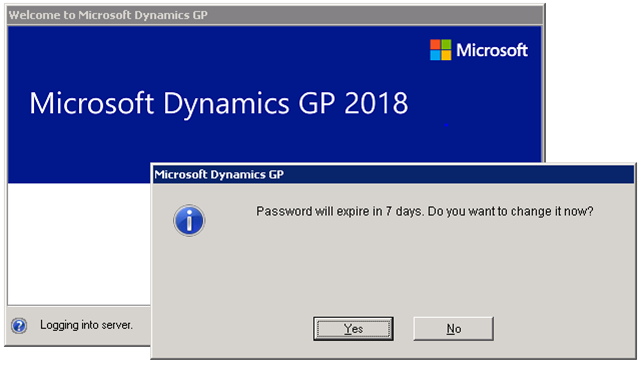 Dynamics GP 2018 R2 Released October 1: Will You Make the Move? Microsoft has noted that the newest version of GP will be available to users on October 1, 2018. In the coming weeks, we will continue to highlight the newest features, discussing how they will help users do more in less time. Are you looking for a GP Partner? Integrated Business Group has helped clients to leverage GP for decades and whether you’re in need of a new implementation, upgrade, or just a partner who can help you with ongoing use, we’re there for you. We invite you to learn more about our services and contact us for more information. At Integrated Business Group, we’ve been in business for over 30 years, many of which we have spent helping clients understand the value of, choose, implement, and operate Microsoft Dynamics GP. We understand the power of Dynamics GP for business and are happy to introduce you to the newest features and functionality of their upcoming release, Microsoft Dynamics GP 2018 R2. GP 2018 R2 offers dozens of new features, fixes, and innovations that make end users’ jobs easier. In the coming weeks, we will explore each of the major improvements as we lead up to the October 1, 2018 release date. Over the years, GP has continued to automate repetitive tasks, helping end users to get more done in less time so that they can focus on informing business decisions. Monthly recurring batches have been around for a while in Receivables, Payables, and Inventory, but users had one problem: Dealing with varying month length. Based on input from users, Microsoft has added a new checkbox called ‘Use last day of the month’ for Monthly and Bimonthly batches. When marked it will automatically set the posting date to the last day of the month. Therefore, if you set up a batch posting date of April 30 and tick ‘use last day of the month,’ the next posting date would be set to May 31. Without the box checked, this would default to May 30. Microsoft initially unveiled Workflow as a self-service tool through Business Portal, embedding Workflows in GP 2013 as a way for users to define the way that a document, master record, or batch “flows” through the system. Over time, Microsoft continued to add to Workflows in GP, creating new workflows in new modules. 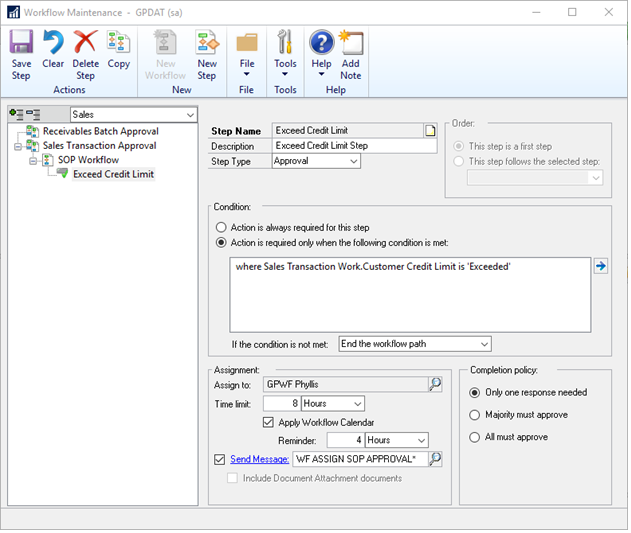 GP 2018 introduced Workflow 4.0, and GP 2018 R2 added new workflow approvals on all transaction types in Sales Transaction Entry. Microsoft added a new email message to work with sales transactions, just like the other workflow types. Workflow history is displayed in inquiry windows too. 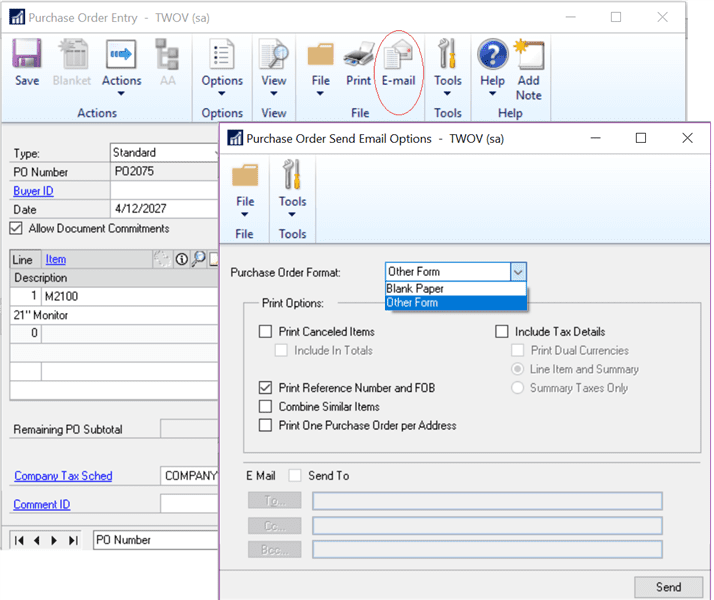 GP 2018 introduced a visual that allowed users to add a visual regarding customer hold status in the Sales Transaction Entry Window. 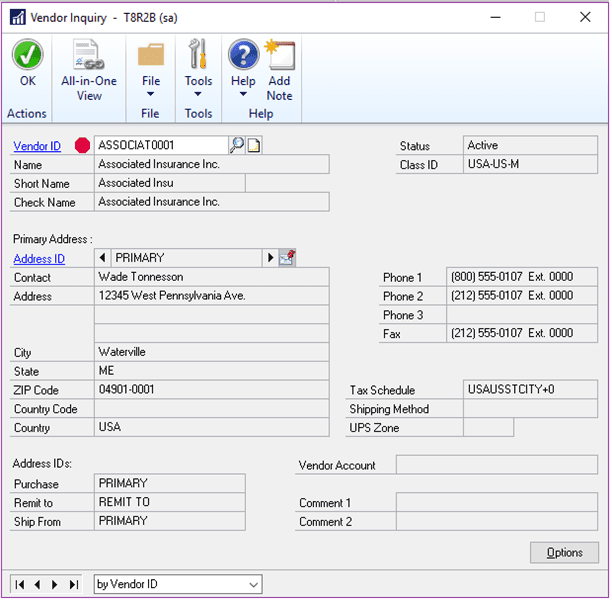 This was a popular feature, and users requested a similar feature be added for vendors to the Vendor Inquiry and Purchase Transaction windows. Now, if a vendor is on hold, a red icon will display next to the Vendor ID in Vendor Inquiry, Transactions by Vendor, Purchasing All-in-One View, and Payables Transaction Entry Zoom windows. Additionally, if a vendor is on hold, GP will display a warning message in the Payables Transaction Entry window before a user attempts to complete a transaction. Microsoft introduced Business Analyzer as a tool to display Microsoft SQL Server Reporting Services reports containing data from Microsoft Dynamics GP 2010 reports, expanding the tool in following releases. Business Analyzer helped many companies, but for some organizations that had less of a need for it, relied on a different visualization or business intelligence platform, or who only needed the tool for specific users, the constant display of Business Analyzer was just… There. Now, GP 2018 R2 has incorporated a universal “Display Business Analyzer […]” option on the Home Page and Navigation List Pages. These options are global settings to make it easier to turn off the feature if companies are not using Business Analyzer. Individual users can still choose to turn on Business Analyzer using customize options. Next up is a feature to make it easier to print the sales invoice for your customer. 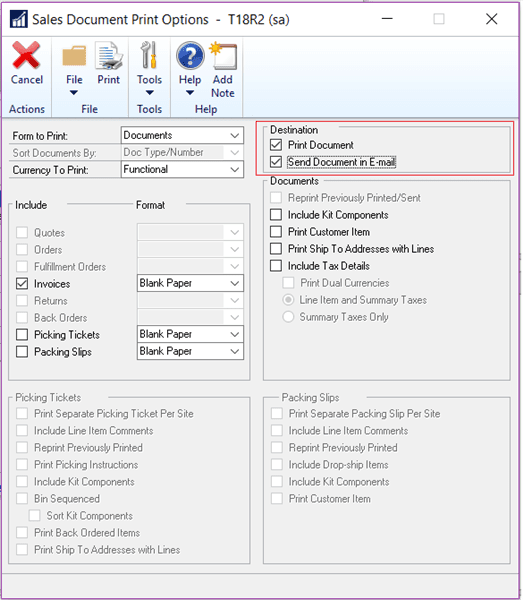 In the Sales Order Processing Navigation List, you can print documents using the option in the ribbon. 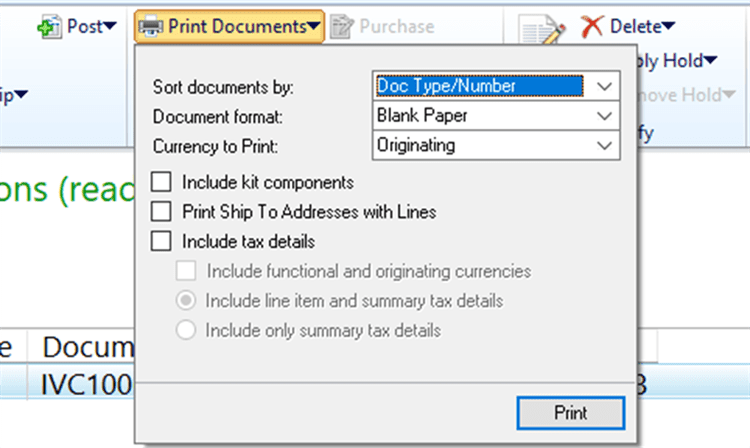 In the Currency to Print field a new option for Functional lets you print the invoice in the customer’s currency. This saves time since you don’t have to navigate to the historical window to print the document. The default currency is still Originating but now you have the option to print in Functional currency from the navigation list. 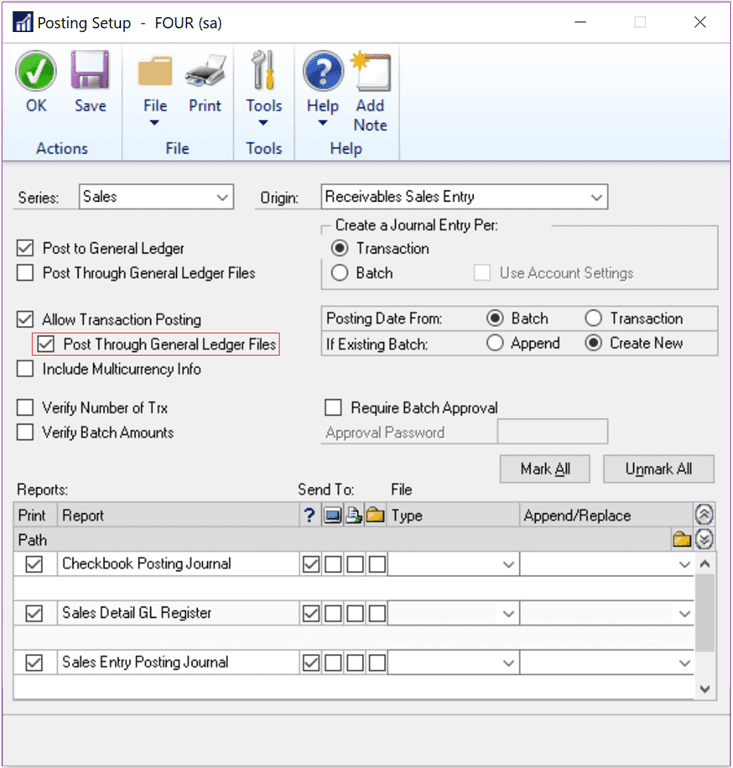 A feature designed to simplify the process of transaction processing, another new feature in Dynamics GP 2018 R2 is a new posting option, Post Through General Ledger Files. 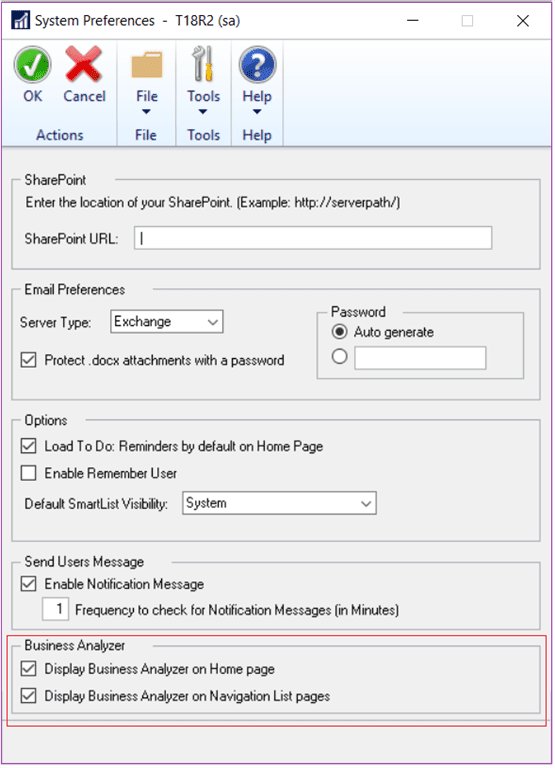 This option is found in Posting Setup and if marked, allows transactions to post through GL. Post Through GL Files will apply to the following transactions: Invoice Entry, Receivables Apply Doc., Receivables Cash Receipts, Receivables Sales Entry, Sales Deposits, Sales Trx Entry, Voided Trx, Maintenance (Sales), Payables Trx Entry, Payment Entry, Purchasing Invoice Entry, Purchasing Prepayments, Receivings Trx Entry, Returns Trx Entry, Assembly Entry, Transaction Entry (Inventory), Transfer Entry, Manual Checks (Payroll), Project Accounting Transaction windows except Project Closing. Microsoft has noted that the newest version of GP will be available to users on October 1, 2018. In the coming weeks, we will continue to highlight the newest features, discussing how they will help users do more in less time. Are you looking for a GP Partner? Integrated Business Group has helped clients to leverage GP for decades and whether you’re in need of a new implementation, upgrade, or just a partner who can help you with ongoing use, we’re there for you. We invite you to learn more about our services and contact us for more information. For more check out part 2: Seven More New Features in Dynamics GP 2018 R2. As we continue to introduce ourselves in our blog series, we are today turning our attention to the product that we’ve worked with the longest—Microsoft Dynamics GP. 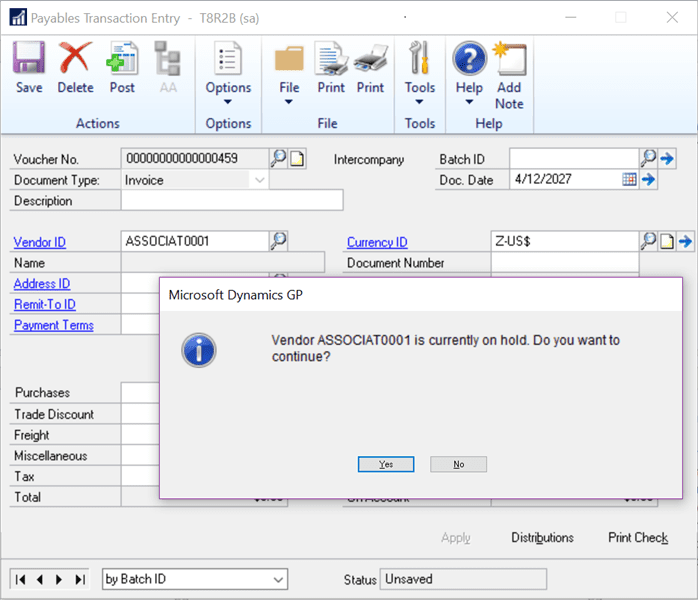 With the Dynamics GP 2018 R2 set for an October 1, 2018 release, we would like to take a short look back at the product, the improvements that Microsoft has made over the years, and offer a brief look at the newest version of the software: Microsoft Dynamics GP 2018. Microsoft Dynamics GP traces its roots to 1981 and represented one of the originators in the market. Acquired by Microsoft in 2000, Dynamics GP continues to be one of the biggest names in enterprise resource planning software for small and mid-market companies. Dynamics GP helps you manage your financials, inventory, and operations. Designed to improve the way companies in a variety of Industries do business, Dynamics GP is available On-Premise or in the Cloud. 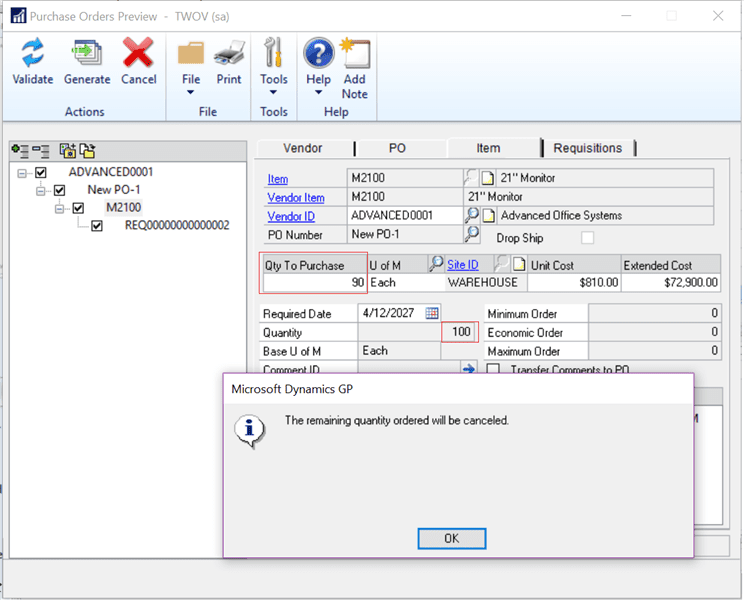 There are currently three versions of Dynamics GP under Mainstream Support, GP 2013 Service Pack entered Extended Support on April 11, 2018 and Extended Support for 2010 ends on October 10, 2020. For the longest possible support for your business, we recommend GP 2018, with the R2 version scheduled for release on October 1, 2018. We will discuss new features in GP 2018 R2 below and in an upcoming blog series. Dynamics GP 2015 marked the major transition to its modern iterations. Introducing Workflow 2.0, web client enhancements, employee self -service enhancements, Management Reporter improvements, and more, the improvements in GP 2015 were built on in later versions. Learn more about Dynamics GP 2015 here. Microsoft Dynamics GP 2016 and 2016 R2 built on previous releases to offer important upgrades to business intelligence capabilities, making improvements to financial management, distribution, project accounting, payroll, and more. GP 2016 R2 improved workflows and added functionality to the same modules on user requests. You can learn more about our work with Dynamics GP 2016 here. GP 2018 is the newest version of the GP line. Built on decades of experience and adding features built around user requests, GP 2018 is the most advanced Microsoft Dynamics GP product available. The GP 2018 release adds to previous releases and enhances specific areas of the product, while also expanding existing functionality, notably in the document attachment and workflow areas. In addition to the major platform and system-wide enhancements, much of the innovation in GP 2018 was focused on the following areas. Workflow 4.0: In addition to new workflows, including general ledger account approvals and purchase order invoice approval, you can copy a step within a workflow, and send reminder email messages from workflow. User experience enhancements: Redesigned to improve the user experience, UX improvements included easier sorting, SmartList control, and major Web Client Improvements. BI enhancements: GP 2018 was built to work well with Power BI, and the GP Content Pack allowed users the ability to slice and dice numbers like never before. 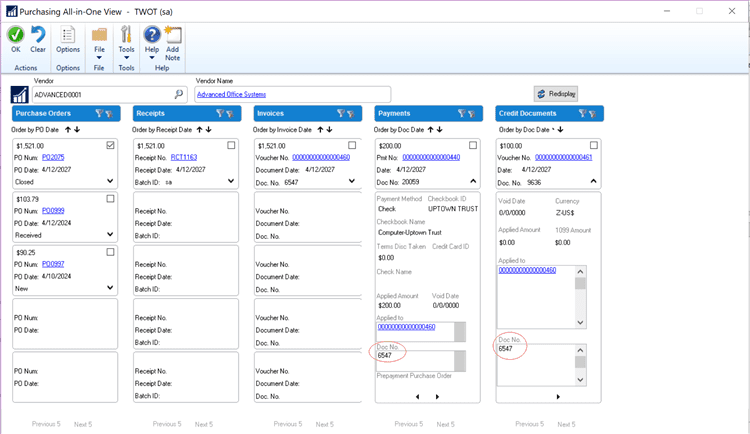 Financials enhancements: Various user experience and functionality enhancements made it easier than ever to use the financials module in GP 2018. Distribution and supply chain enhancements: Advancements to purchase order generation, printing, sales transactions, and more graced the new GP 2018 release. Human Resources and Payroll enhancements: Various improvements to the HR functionality included the ability to roll down changes, take control over printing garnishment reports, and update department codes in data tables with ease. GP 2018 built on the advancements made throughout the life of the product and continues to provide better experience for customers. Learn more about the power of Microsoft Dynamics GP 2018 here. Many businesses wait for the R2 version of Dynamics to come out to make the move. Often released within the first year, these updates provide the necessary bug fixes as well as user-requested functionality. With Dynamics GP 2018 R2 on the horizon, we will discuss the enhancements that Microsoft is making in R2 in a series of upcoming blogs based on Microsoft’s Feature of the Day series. Ready to discuss your move to GP? Learn more about the product and contact us for a free consultation.